The Soloist was a surprisingly good movie. An intriguing true story, it was captivating. But it bothered me how the writer and director seemed to be keeping a distance from getting really real or raw. Sure, there are some intense moments when Ayers increasingly loses touch, but these were bookmarked by typical Hollywood heartstring-puller scenes. I was worried that the whole thing would succumb to a happily ever after ending. You could argue that it does, but I feel that the ending, as far as endings go (endings never happen in real life, why do we expect them to in movies? ), was impressively real and honest and had a sense of unnerving incompleteness, even as the cast of characters sat there for us, watching the orchestra. The next morning, I looked at the DVD case, and quite liked what I saw. Initially, I thought the movie poster was simple and boring. But now that the story was on my mind, I realize that the poster is simple, maybe even boring, but that does not make it bad. Actually, it’s very effective, because it shows the dynamic between the two main characters. Ayers (Foxx) is very much in his private world, and cares for nothing but playing music. In the poster, his hand and facial expression are dreamily wrapped around the neck of his instrument. Lopez (Downey Jr) is intrigued, but distant. Throughout the film, Downey Jr plays Lopez with an admiration for Ayers that is also tainted by an inability to actually comprehend who Ayers is and how he connects to music with as much love as he does. In the background is Los Angeles, which isn’t just the city that the movie takes place in, it’s actually very important to both characters, as Lopez is a writer at the LA Times, and Ayers has transplanted himself to L.A from Ohio. Ayers references it many times throughout the film, as when he relates Lopez to the airplane flying over L.A. 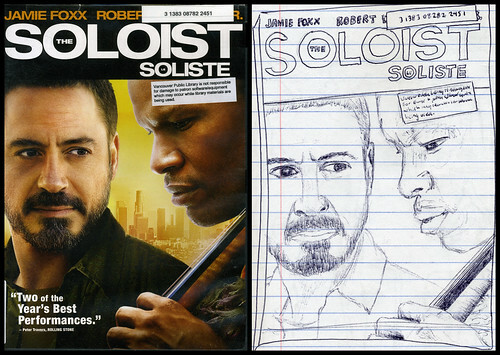 This unexpected admiration for the movie poster forced me to draw it. Downey Jr’s facial features are slightly misplaced, and he looks cartoony, but I’m happy with it overall. Connection and love. ← Ceramic Explodes Against The Wall, Is Your Zygoma As Brittle?